SELL A HEALTHIER SPREAD THAN NUTELLA! If you are selling to grocery shops, delis, bakeries, farm and health shops become part of our team of agents to work exclusive areas in the UK and Ireland. 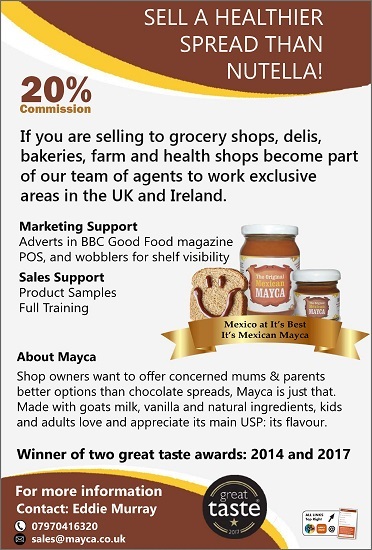 Shop owners want to offer concerned mums & parents better options than chocolate spreads, Mayca is just that. Made with goats milk, vanilla and natural ingredients, kids and adults love and appreciate its main USP: its flavour.